The St. Mary’s moot court team of Sophia George, William “Billy” Calve and Devin deBruyn won the ABA National Appellate Advocacy Competition in Chicago on April 8, 2017. For the second year in a row, St. Mary’s University School of Law students swept the championship in the American Bar Association National Appellate Advocacy Competition. “St Mary’s has prided itself on its strong advocacy programs and outstanding moot court teams. This win adds an exclamation point to that reputation,” said David A. Schlueter, J.D., Hardy Professor of Law and Director of Advocacy Programs at St. Mary’s. Winnowed from more than a hundred teams across the country, the final competition held April 6-8 in Chicago including representatives from Georgetown University Law Center, Vanderbilt University Law School, William & Mary Law School, University of the Pacific’s McGeorge School of Law, Stetson University College of Law and University of Oklahoma College of Law, among others. 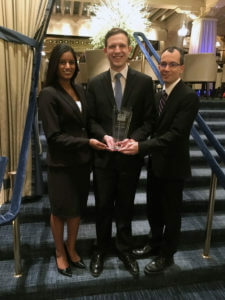 After the hundreds of hours of preparation, the St. Mary’s Law External Advocacy Program (EAP) moot court team of third-year law student William “Billy” Calve of Dickinson, third-year law student Devin deBruyn of San Antonio and second-year law student Sophia George of Sugarland won every round of the national championship. Calve was also on the team that won the 2016 national championship. Considered by many to be the most prestigious moot court competition in the country, the event measured the oral advocacy skills of law student teams from across the nation by simulating an appeal experience before the United States Supreme Court. Students write a brief, then argue their case before a mock court in the Everett M. Dirksen U.S. Courthouse. It is the third time a St. Mary’s Law team has won the national championship in the past 15 years. Competition judges also recognized deBruyn with crafting the fifth-best brief in the nation. George also attributed her advances in advocacy skills to Poole’s guidance.